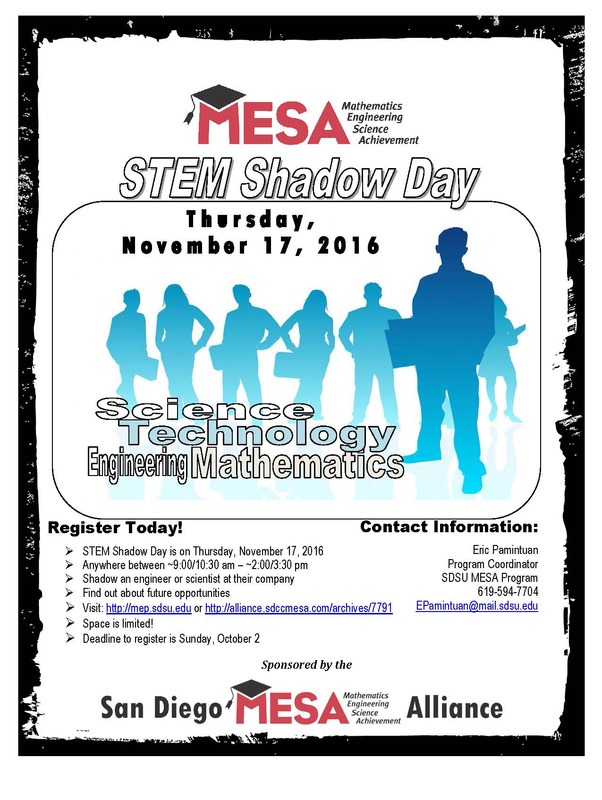 MESA’s STEM Shadow Day will be on Thursday, November 17, 2016. If this will be your first time participating in STEM Shadow Day, the way it works is simple. Students typically shadow a math, science or engineering professional from your company from approximately ~8:30-10:00 am. to ~2:00-3:30 pm. During this time, we ask that you provide the best experience possible; this is after all a potential employee. Should you choose to participate, you have the flexibility to structure your STEM Shadow Day agenda to best match your company’s environment. Through this program, students can picture themselves in these positions; in the near future and can also create goals to get there. Deadline extended for students until remaining spots are filled. November 17: MESA STEM Shadow Day! Step 1: Please review the STEM Shadow Day industry info packet (includes program overview, sample agenda, timeline, etc.). Step 2: After reviewing the STEM Shadow Day student info packet and you are still interested in participating, please register at the link below (the link is also on the last page of the MESA STEM Shadow Day Student Packet). As stated in the student info packet, registering doesn’t guarantee you a STEM Shadow Day spot. Step 3: If matched, you will be given further instructions and will be required to attend one (1) mandatory STEM Shadow Day Preparation meeting. See the choices on our Google Calendar or on your student info packet. Pre-college students (high school) will be informed by their MESA Director/Adviser of their meeting choice(s).